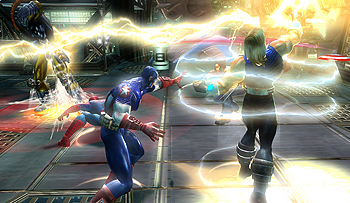 Marvel: Ultimate Alliance is a great game … just not for the Wii. I originally played it about a month ago on an XBox 360 and was quite impressed, and then I noticed that it was launching with the Wii. Something told me to lay off the knee-jerk purchase and use good ol’ Game Fly once again to test the waters with minimal cost. I sent the game back in four days. The X-Men: Legends series is fantastic. 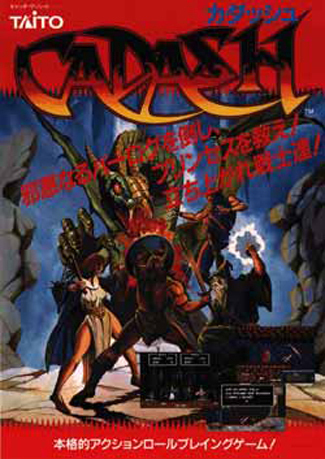 Four-player (later over XBox Live) superhero, beat-em-up RPG. You just can’t go wrong. I played both versions through about three times trying to level up the thirty-some-odd unlockable characters, loving every minute of it. So when I heard that Marvel was teaming up with the same developer to make a game with over 150 playable superheroes spanning the entire Marvel universe I could barely wait. I decided to wait once I saw it in action on a 360, and in the meantime I had read some strange things about the Wii version and the game eventually made its way to the top of my rental queue. After about eight hours of gameplay I found that there are essentially two major problems with the game: the poor graphical presentation and the horrible control scheme. Once I decided to put up with the laughable looking character models and try to learn the intricacies of the controls, I got a little deeper into the game and then the pain really began. That’s some seriously pixellated fire, Mr. Fang Foom. Graphically, this is a N64 game. I’m not joking. Just take a look at that screenshot … I mean, that’s Double Dragon-quality fire folks. I know the Wii isn’t anywhere near as powerful as the other next gen consoles, but come on. I have Rayman: Raving Rabbids and that game looks at least ten times better than this, so I know what the system can do. Graphics usually don’t stop me from playing a game if it has some solid gameplay, but it was incredibly hard to get over the difference I noticed from the 360 version. It’s like they ported this from a GBA. Horrible. 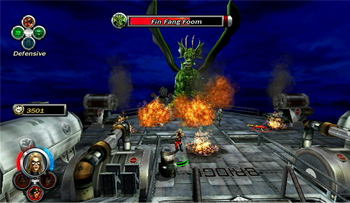 A shot from the 360 version of the game. I mean, I think it’s the same game. The spotty controls were the nail in the coffin. Simple attacks require you to shake the Wiimote back and forth repeatedly, resulting in sloppy response and a sore wrist after about five minutes. There are also three more attack moves you can pull off by popping the controller up, slamming it down and sliding it to one side … all resulting in fairly useless attacks that are impossible to string into more than a three-hit combo. Special attacks use the same movements but require you to hold down the trigger. Once you start unlocking more superpowers for your characters you realize that four movements aren’t nearly enough to accommodate everything. The worst feature I found was the camera control. You have to tilt the chuck on its side to rotate the camera around, and on more than one occasion I was surprised by a nauseating spinning screen and realized it was because I had my hand the slightest bit sideways. All in all, an incredibly disappointing package for the Wii.